Once upon a time, running back was as much of a glamour position in football as quarterback. The men who moved the ball on the ground were just as likely to win the Heisman Trophy and get selected high in the NFL draft as those who tallied yardage through the air. Things have certainly changed over the last decade or so. NFL teams are increasingly OK with having a few decent running backs share the carries, rather than one feature back around whom the entire offense is built. College teams are moving more toward pass-happy spread offenses in which running backs aren’t as important. Quarterbacks are unquestionably the darlings of the sport, while running backs are becoming mere supporting actors. The numbers prove it. Thirteen of the last 14 Heisman winners — including the last five in a row — have been quarterbacks. Seven of the last eight NFL Most Valuable Player awards have been given to quarterbacks. And the last two NFL drafts have gone by without one running back being chosen in the first round, while four QBs have been first-round picks. This year, however, things could start to swing (at least a little bit) back toward the running backs. As many as four RBs could go in the first round of the 2015 draft: Georgia’s Todd Gurley, Wisconsin’s Melvin Gordon, Indiana’s Tevin Coleman and Nebraska’s Ameer Abdullah. The smallest of the group, Abdullah, is a practicing Muslim who finished college with a bachelor’s degree in hand and his name all over the Cornhuskers’ record book. As a senior this past season, the 5-foot-9, 205-pound speedster ran for 1,611 yards and 19 touchdowns. For about half of the season — before Nebraska suffered a few too many losses and Gordon surpassed him as the most productive back in the Big Ten conference — Abdullah was a legit Heisman candidate. I’m the youngest of nine kids. Grew up in Birmingham, Ala., in a very family oriented atmosphere. It helped me become more of a giver than a taker. We all have different and diverse personalities. We have the easy-spirited people in our family. We have the kind of uptight, business-like people. We have people who are passionate in law, journalism, people who are accountants, pharmacists. Honestly, I’m the self-proclaimed failure of the family. My parents did a great job of raising the first third of the Abdullahs, and those three were great influences on everyone else. By the time it got to the seventh, eighth and ninth child — the last batch — they just let us absorb and become sponges of our older siblings and absorb our good habits from them, let us learn the hard way and also let us benefit from what they’d already been through. With me, they were pretty Laissez-faire, pretty hands off. Everyone in my family played a sport, either collegiately or high school. But I am the first one to have the opportunity to play professionally. I just signed with adidas, so they were really stoked about that. Ever since I was in high school, they always believed in me. They always thought that I would be here. They realize all the workouts I was putting in paid off, and a lot of the stigmas that were placed on me in high school are being proven wrong again. Size is something everyone over-sensationalizes. I’m not the big running back. I’ll never be 6 feet. But if you look at my height or weight — 5-9, 205 — that’s not tiny. I really do pack a punch. I’m pretty strong in my lower body, and all my weight comes from muscle. I don’t have much fat on me. So, when I deliver a blow, it’s more effective a lot of the times than a guy who is maybe 6-2, 220 because he’s not as strong. I feel like a lot of times it can be easily associated that a guy who is smaller won’t be as durable, too. You can’t really say that until you just let them go out there and play. I emphasize being someone who’s productive when I have the football. I’ve also learned through this process that you can never really reach your ceiling. I feel like having the opportunity to focus on football without school now has allowed me to get a lot better physically, a lot stronger, a lot more well-groomed as a running back. I feel like there’s going to be a lot of growth with my game now until draft day. In high school, a lot of guys said I was too small. Then I went up to Nebraska and competed with running backs who were highly recruited over me. A lot of guys thought, ‘Oh, there’s no way he’s going to be productive at 5-9, 180,’ my sophomore year. I put on weight, got up to 200 pounds and put together three 1,000-yard seasons in a row. A lot of guys thought, ‘There’s no way he’s going to get drafted at running back.’ I got a Senior Bowl invite, made the most of it, got the MVP and went to the combine, became one of the top overall performers, and now I’m in position to be drafted hopefully pretty high. I don’t talk about that stuff much, because I feel like anytime I watch film on myself, I’m always critical. I was No. 1 in four out of seven drills (among running backs) at the combine — vertical jump, broad jump, three-cone and 20-yard shuttle — but I’m going to go for a faster time in the 40-yard dash at my pro day just to help me sleep a little easier. That’s how I am. I’m a competitor. I let my siblings brag for me. I know they’ll let people know I proved ’em wrong. But I know they’re proud of me. They’re happy for me no matter if I play one year in the NFL or 11. The mock draft at DraftCountdown.com has Abdullah going to the Buffalo Bills with the 50th overall pick; at WalterFootball.com, he is slotted 54th overall to the Detroit Lions; and at NFLDraftGeek.com, Abdullah is projected to go to the Baltimore Ravens with the 58th pick, all in the second round. While he still has time to move up the boards, Abdullah might not hear his name called in the first round of the draft. He might not be invited to Chicago for the proceedings or take that walk across the stage to shake hands with NFL commissioner Roger Goodell. But he certainly won’t be one of the players sweating it out in the final rounds of the draft, wondering if he’s played the last football game of his career. 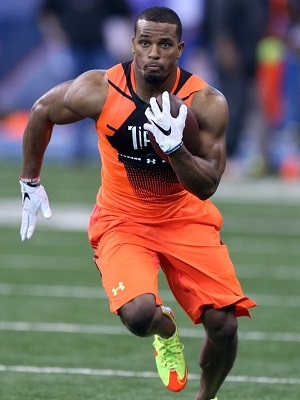 If Ameer Abdullah wants an NFL career, he has one waiting for him. But more than maybe any other prospect in this draft, he inspires confidence — even from strangers — that he’ll be just fine making it in this world without pro football on his resume.